A superb sandbox skater that makes a virtue out of touchscreens. We're positively drowning in match-three puzzlers and physics games on the App Store, but given the tactile nature of touchscreens it's a wonder we don't see more games that mimic the likes of SSX. It'd be easy to assume that True Skate in particular would takes its cues from the Tony Hawks franchise, but instead of being an arcade game it's a surprisingly complex simulation. The whole game is set within a sandbox playground, and while it isn't the largest we've ever played in it is wonderfully crafted with a visual performance that's as smooth as butter. There are plenty of pipes, rails and steps to be played with too, and while we'd like to have had a little more uncluttered space to breathe while learning the basics of the game, it's a fair trade off given the freedom that's on offer. Thankfully, you're presented with the very basics of the game early on: swiping along the floor gets your skateboard up to speed, just as a foot on the ground would. Swiping the tail of the board will lift you up to begin an ollie, and then you'll have to smooth out the board for an elegant landing and a successful points score. Those controls are impressively slick, although it will take you a while to master even the basics and wrap your head around the concentrated and precise control needed to make progress around the park while avoiding obstacles. Once mastered though, the game has an incredibly natural feel to it, and it's apparent that this initial trickiness is a necessary by-product of the game's flexibility. 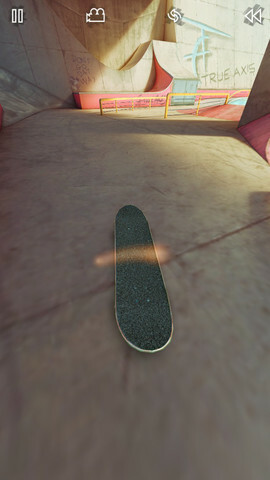 Once you've completed the introduction, you're free to either whizz around the arena, stumbling across new tricks like rail grinds and board flips, or take on the missions. There's a decent variety of these, and some might have you attempt a high score within a fixed time limit, or challenge you with completing particularly tricky moves while following a 'ghost' leader. This is the one area where True Skate trips up a little, as the accuracy required is far too punishing. Fortunately, there's more than enough fun to be had in the sandbox mode. 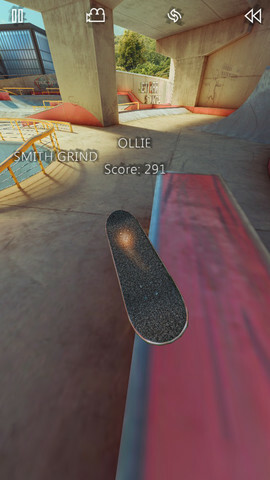 In many ways, True Skate represents the very best of what can be achieved with mobile gaming. It makes a virtue out of touchscreen controls, rather than a burden, and it's hard to see how any traditional controller could provide a more tactile and intuitive feel for the skate experience. It's a playground for you to lose yourself in for five minutes on the morning train, or five hours at home. At $1.99 it's still great value for money, and a reminder that you very often get exactly what you pay for on the App Store. What's Hot: A fantastic sandbox, with enough mission content to satisfy those who prefer a sense of direction. Superbly tactile and intuitive controls. What's Not: You'll need to invest some patience in mastering the controls, and much of the mission tuning is brutally unforgiving.